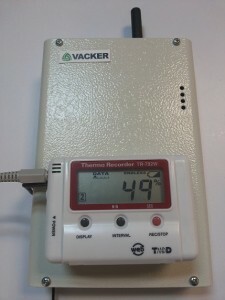 We have recently installed our integrated solution for monitoring and recording Temperature & Humidity which also gives phone call if the temperature or humidity goes above or below the defined limits. The device has one sensors which will sense both temperature and humidity of the server room, refrigerator, cold room, ware house, hospital rooms etc. the sensor can be pulled to a distance of 3 meter from the device. The entire unit is assembled by us and can be fixed by the customer by themselves with easy to use instructions. we provide complete solution with sensors for monitoring any of your critical parameters. Please see more on the phone call alert system at our webpage, which is used for server room, data center, cold room, ware house, refrigerator, freezer etc. Vacker presently operates directly and through associates in UAE,Saudi Arabia, Oman,Qatar, Kuwait,Nigeria,Ethiopia,Sudan,Ghana,Djibuti etc. ‹ Phone Call/SMS alert for Monitoring Temperature, Smoke,Fire, Water leakage etc.